I upgraded from the default Lenovo WWLAN to an Intel 7265NGW and I now get this error. Searching through the Hardware Installation Guide, I know I purchased the right WWLAN because it is the same part number as in the document. I'm not sure where to go from here so any help would be very helpful. Is it a Lenovo branded card? 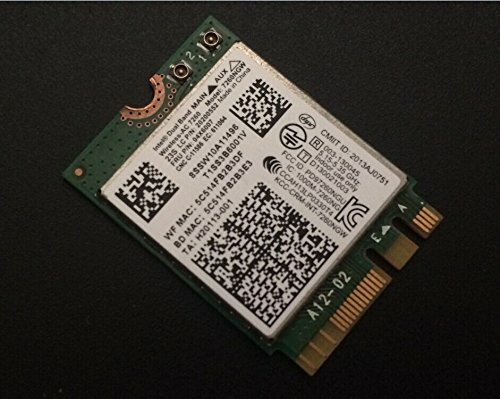 Lenovo machines require using Lenovo branded wifi cards, even if they're the same 7265NGW. Probably not, can you buy a Lenovo brand WWLAN (7265NGW) outside Lenovo? By same number do you mean the same FRU number as given on page 67-68 of the hardware maintenance manual? Or the same model number? If they don't have the same FRU number that is the error that you observe. I meant the model number. Come to find out, the FRU# in the Hardware Maintenance Guide doesn't match the FRU# on the WWLAN. Actually, the "FRU" number from the guide is actually the LC P/N. The FRU P/N is 04x6007 for mode# 7260NGW LC P/N 20200552 Intel WWLAN. I ended up finding one on Amazon and will be purchasing it to try it out. Please, feel free to let me know if I am heading in the wrong direction!! You might be correct. However I long give up with the whitelist and just bought a dongle as a replacement for my unit. Any luck with the intel 7260 ac card? I am thinking of getting the same wifi card to upgrade my Y50. Same problem here, purchased the 2:2 7265 to repalce the useless single radio 3160 card that came with it. We are actually getting this error on a fully WIFI certified card, so why does it not work??? I have just downloaded the latest Bios, v 3.03 and am still getting the same error. This is an absolutely unacceptable situation... Lenovo has no right to block me from replacing the crappy wifi adapter with a MUCH better one. Lenovo does have the right to refute my warranty if I do so, but no right to block me from using the hardware I'm interested in using. This is actually beyond ridiculous.. Is lenovo trying to beApple?????? I would NEVER have purchased this laptop had I been aware of this and have absolutely no interest in it if this problem isn't fixed. Now, support.... where is the fix for this, in this year old thread????? IF No fix is available for this issue, I would like a refund on my otherwise fantastic laptop.